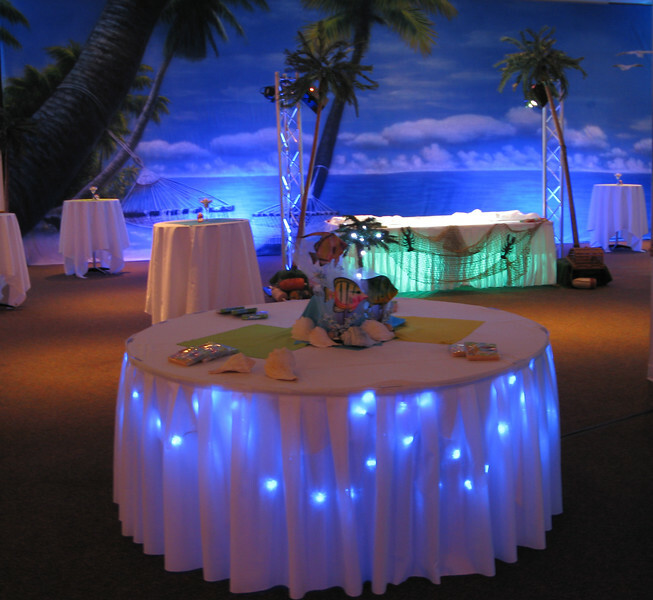 Beach Birthday Party- Here's a great example of 2 kinds of under table lighting. The table in the front is under lighted with blue LED string lights. The table in the back is under lighted with 2 PAR 250 cans. The table in the front is done with about $15 worth of lights. The table in the back has about $400 worth of lights underneath. The beach backdrop we rented and we rented the palm trees to cover the light towers that are highlighting the top of the table and the backdrop. Cabaret tables allow guests to set down their drinks and appetizers as they mingle.